"How come there's no Halloween in India? Because they took away all the Gandhi!" Sure, things are testy on the geopolitical stage, and yes, there are huge cultural chasms that separate America from the rest of the world, particularly those nations in which a majority of citizens practice Islam. But does that make it a comedy gold mine, or are we all just a bit too touchy to laugh at this sort of subject matter? That's a question that doesn't get the full-fledged answer it deserves from Albert Brooks' movie, which bears much of the trademark wit of the man who wrote, directed and stars in it, but it's really pretty thin, a hopeful premise that doesn't bear much fruit. The action starts in L.A., with Brooks playing an on-screen incarnation of himself, outfitted with the perfectly decorated colonial house, accessorized with a lovely wife and adorable child, but professionally, things aren't exactly breaking Albert's way. Penny Marshall is forced to take a meeting with him, though she's got absolutely no interest in casting him in her remake of Harvey; professional salvation comes in the form of a registered letter from Washington, D.C. Brooks flies there to meet with a Presidential committee headed by former Senator and Law and Order regular Fred Dalton Thompson: will Brooks become a sort of ambassador at large to the Muslim world, in an effort to understand what makes Muslims laugh, and to forge a better cultural connection with them? All he'll have to do is turn in a 500-page report. 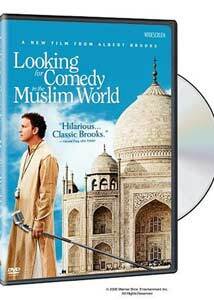 So Albert packs off to India and Pakistan, where he's chaperoned by a Mutt-and-Jeff duo from the State Department, and hires a capable Indian assistant with a jealous Iranian boyfriend. Certainly much of the joke is on Brooks, and the Indians react to him as anybody in any country would, some random foreigner accosting them in the street and asking them what they find funny. Add to that the fact that Brooks touts his bona fides as a representative of the U.S. Government, and it's no surprise to see the Indians fleeing in the other direction. Brooks decides to offer his hosts an evening of standup, to see what sort of material they respond to; the answer, of course, is none of it. There's some nice interplay between Brooks and his doofy sidekicks, at least� John Carroll Lynch and Jon Tenney are deadpan funny as the guys from Foggy Bottom, and Sheetal Sheth is game and endearing as Maya, Albert's girl Friday. But you come away wishing that Brooks had set his sights a little higher, and been a bit more rigorous, because these days especially, whatever your faith, we could all use a good laugh. Image Transfer Review: A nice enough transfer, preserving many of the picture-postcard images of the Indian landscape, but nothing spectacular. Audio Transfer Review: Maybe a little overmixed on the 5.1 track, but some of the funniest stuff is here, actually, including more than a few bars of There's No Business Like Show Business played on a sitar. Extras Review: Other than an original trailer, the only extra is a short package (04m:31s) of four deleted scenes, the best of which features Brooks desperately looking for validation by trying to find one of his own movies at a New Delhi video store�the clerk helpfully provides him with copies of Blazing Saddles and Spaceballs. An effort from Albert Brooks that's only modestly funny�he's smart enough that it's not insufferably solipsistic, but it doesn't really follow through on its promise.